Is Thatch Spoiling The Look Of Your Lawn? If so, professional Lawn Scarification is the best solution to help solve your problems. This is a vital ‘spring clean’ for the lawn, and an essential Annual Treatment to remove excessive organic matter and moss from around the stem of the grass. This helps to maintain a healthy growing environment and give renewed grass thickening during the warmer months. If left, thatch will begin to block any fertiliser from penetrating the soil and can provide the ideal conditions for fungal diseases and a home for unwanted insects. During scarification the tines (rake-like spikes) will also cut into the surface of the soil helping with the absorption of water and essential nutrients. 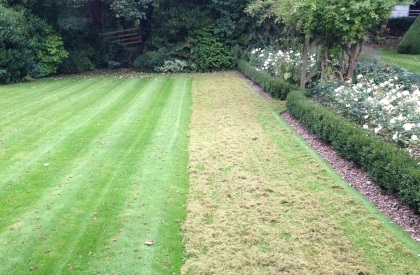 Regular scarifying of a lawn will keep the thatch layer (build up of decaying organic matter i.e. 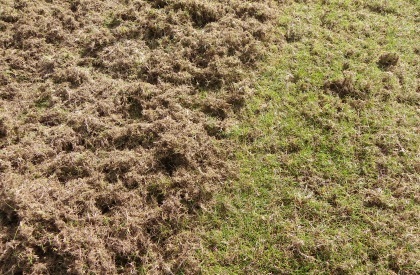 grass clippings, dead moss and other debris) at an acceptable level ideally around 1-1.5cm.